I found myself having nothing to do on a Friday night and hungry. My options were to hunt for food in Queens or around work in Westchester. I let the red traffic lights decide whether I got on the highway to head down to Queens or straight to a restaurant nearby. I ended up at Haiku’s Asian Bistro on Mamaroneck Ave, in Mamaroneck NY. I knew what I was walking into- a bastardized version of Asian food. But I was pleasantly surprised! 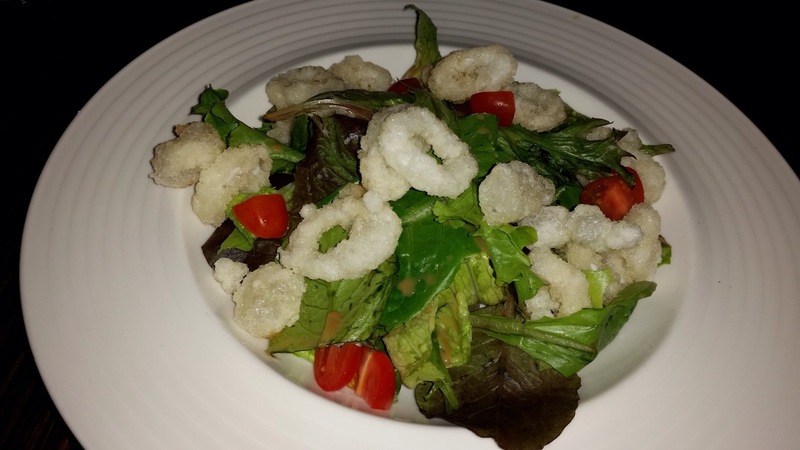 Crispy Calamari Salad with miso vinaigrette dressing. This is truly an Asian fusion dish. The fried calamari is made with a sprinkle of Chinese five spice and Chinese white pepper, the traditional way to prepare Chinese fried calamari. Yet we would never lay crispy calamari on a plate of raw greens, cut up cherry tomatoes and dressing. Regardless, it was delicious. The combination of the east and the west worked. 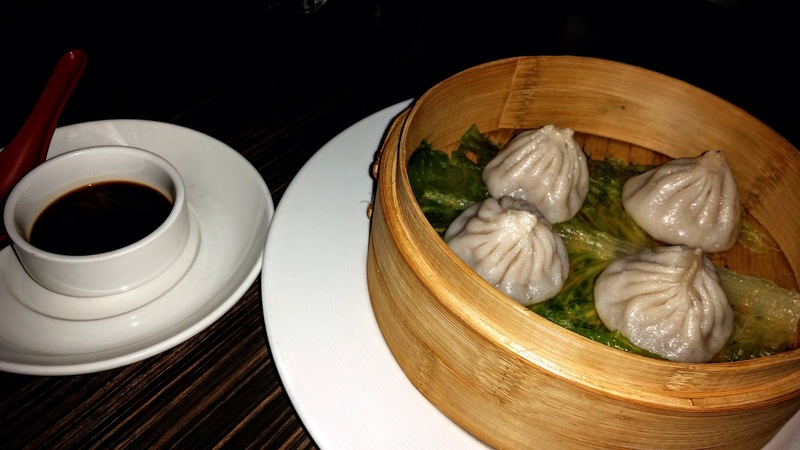 Special: Chinese soup dumplings. I saw this special on the table. A little surprised that they were offering an authentic dish. It prompted me to test it out. It was authentic, all right. Not the best soup dumplings I have ever had. The skin was a bit thick. But it was very decent and it was authentic. 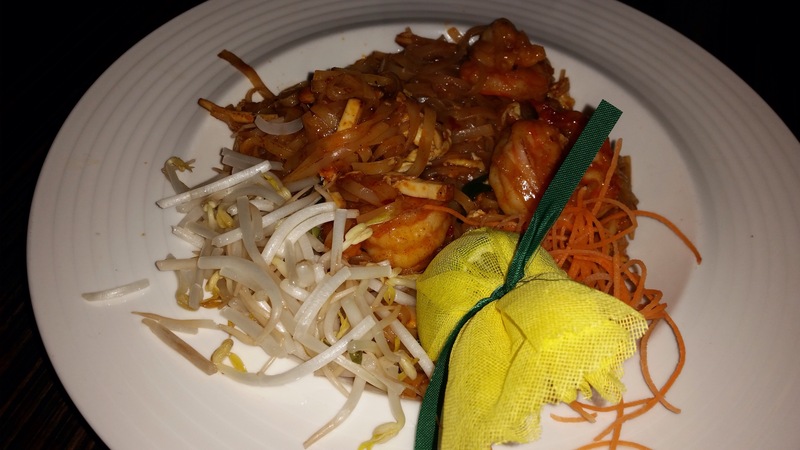 Pad Thai Noodles: spicy Thai flat noodle with jumbo shrimp. By this point, I was full. Ate the jumbo shrimps but packed up the rest. Never got a chance to finish it because I forgot it in the fridge. Haiku, like Red Plum next door, offered all kind of Asian food (Japanese, Chinese, Thai, etc.) But I like Haiku a lot better for the fact that they are trying to be authentic when they can. I give Haiku both thumbs up for the effort and I will return to encourage. Happy Thursday my friends! Let’s all try a little bit harder and be ourselves despite our circumstance. This was a funny visit where I tested Red Plum’s ability to understand English and be flexible. I had been to Red Plum before with so so experience. Read my prior post (Reliable Old Shoe Asian), click here. 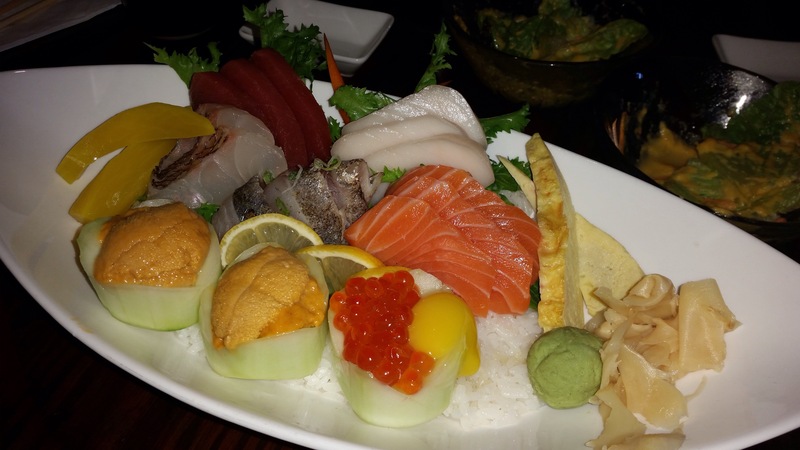 Red Plum offers bastardized fusion Asian cuisine, from an authentically Asian perspective. Let me just say that there is nothing wrong with it if that’s what the local population wants. Hey, I live in a bastardized area and I deserve this Americanized version of Asian cuisine for being highly assimilated. Sashimi Lunch: 12 pieces of assorted sashimi with rice, served with miso soup and salad. This was perfectly fine. Simple and straight forward for $13. They even put a light inside the ice-cube. The extra touch was fun. But in tomorrow’s post, I will show you how to have a lot more sashimi for not a lot more money. Chirashi Special: 17 pieces of raw fish and vegetables over sushi rice. This was also fine for $20. 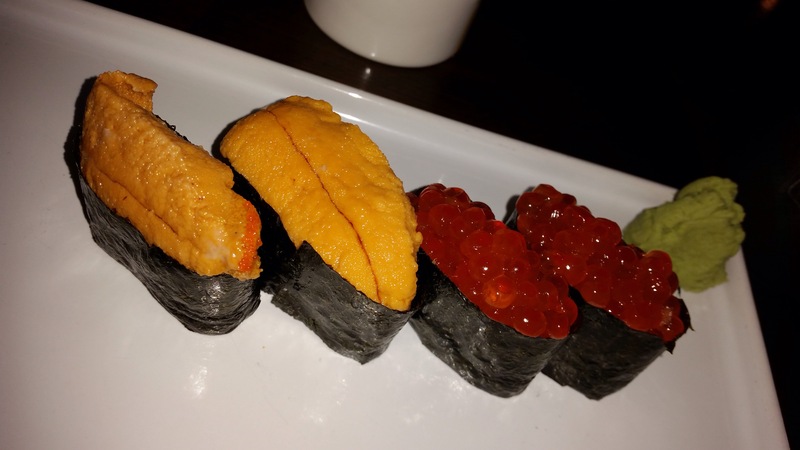 The fish was fresh and the uni was very tasty. Here is where the story gets interesting. 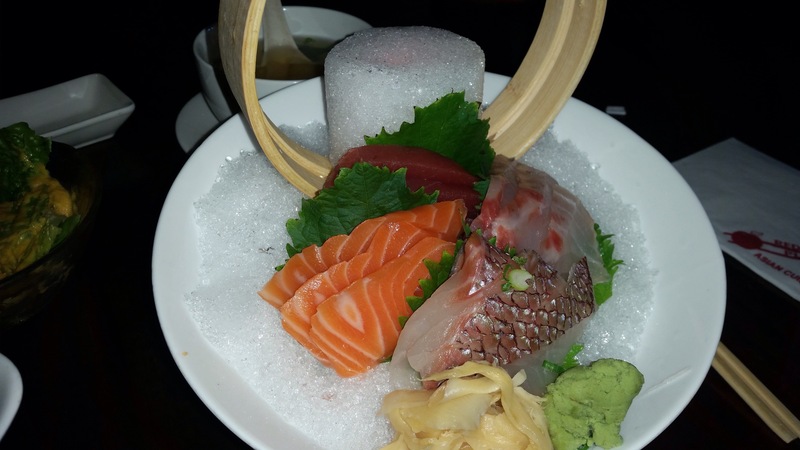 I went with a picky friend who insisted that sashimi must be placed on the rice in a bowl, like how it is done in Japan, and not placed directly on ice as how Red Plum always serves their sashimi. He has a point! 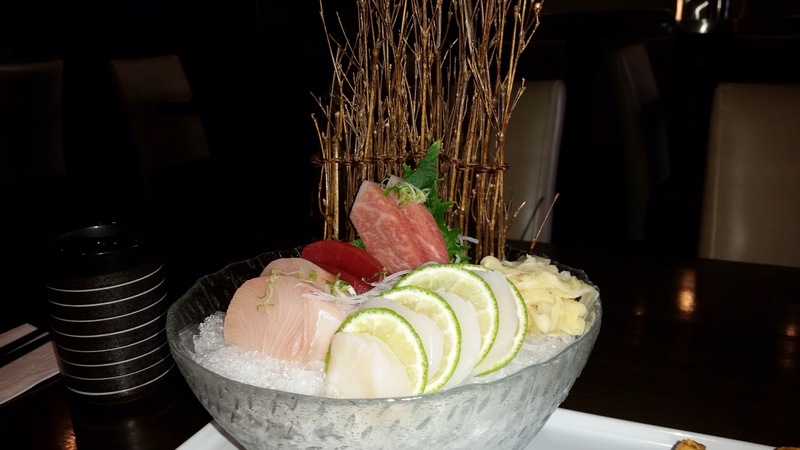 When chirashi is served on a bed of ice, it is very cold and a lot less appetizing. Further, if that’s how the Japanese eat their chirashi, should the Americans and the Chinese really argue with it? Red Plum is run by the Chinese, as far as I can tell. My friend explained his request once to the waiter. The waiter did not understand and brought in a waitress, who presumably has better language skills. In the meantime, the wait staff were talking to each other about this request all in Mandarin, which I understand. My friend explained it again, in English, to the waitress. Then came a long conversation, back and forth, with the waitress attempting to clarify the “weird” request and my friend not understanding why she doesn’t get it. I finally could not listen anymore, after about five minutes of this… I interrupted in Mandarin and repeated the exact same request, in Mandarin, to the waitress. Her response to me was, “That’s really what he wanted?” She did understand him but she didn’t believe what she heard! She also confessed to me that they didn’t have a bowl! Hmm. No bowls in a Chinese restaurant… I told her that there must be one, somewhere back there. P.S. This is my December writing challenge 5 of 17, writing one post a day until I leave for vacation.